Display model of Tiangong I module at an exhibition hall at the China Academy of Space Technology, complete with access door for public viewing. A Long March 2F carrier rocket for Tiangong I arrived at China's Jiuquan Satellite Launch Center on July 23. Personnel and facilities from all subsystems and payloads are gathering at the launch center for the mission of the space laboratory, which are reportedly going well. 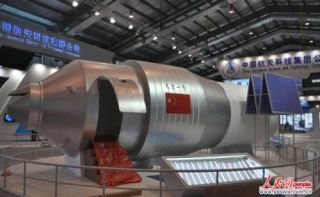 China, a burgeoning power in the world space community, is poised to launch a test module for its first space station. The question is, when? The liftoff was initially expected to take place in the fall. However, the Aug. 19 failure of an unmanned Chinese satellite to enter orbit has delayed the rollout of the module, named Tiangong-1 ("Heavenly Palace" in Chinese). When China does succeed in launching Tiangong-1, it will mark the first in a series of steps toward the nation's goal of building its own 60-ton space station by the year 2020. An unmanned Shenzhou 8 spacecraft would launch a couple of months after Tiangong-1 and dock with it, in a demonstration of the autonomous docking technology necessary for assembling the station. "The ability to do that robotically is going to certainly be a technological step forward for them," said Joan Johnson-Freese, chairwoman of the Department of National Security Studies at the Naval War College in Newport, R. I. "Some people have compared this to where we were at with Gemini. But we were doing it with people. If they can do it with robotics, it's a demonstration of a technological step forward." China launched one astronaut on its first manned spacecraft, Shenzhou 5, in 2003. Since then it has sent five more men into space and performed the nation's first spacewalk. "They have clearly established themselves in the top tier of spacefaring countries," Johnson-Freese told SPACE.com. "There are only three countries in the world who have the ability for human spaceflight, and China's one of them. If it were easy, there would be more countries that would have done it." China has announced its plans to build the manned space station, but beyond that, it isn't sharing. "It's part of a multiphase, incremental, but very ambitious program," Johnson-Freese said. "You go to low-Earth orbit, then you go on to the moon. If you have the political will and the funding, you continue from there. They have not officially declared for a manned lunar landing, but clearly that's the brass ring they will eventually reach for when they have proved the technology along the way." China's space ambitions serve multiple national goals. By charting achievements in space, the nation is driving the development of its science and technology community, increasing its military might, and sending a powerful signal about its status to people at home and abroad. "Space is very much an indicator of a country's willingness to look into the future," Johnson-Freese said. "It has a lot of symbolic resonance as well."